March 11, 2019 - Roof it Forward is proud to announce its 2018 4th quarter donation to Camp Sunshine in the amount of $17,200. To date, Roof it Forward's support has exceeded $181,000. February 9, 2019 - ARAC Roof it Forward is proud to announce that it has earned the home service industry's coveted Angie's List Super Service Award (SSA) for the 6th year in a row. January 22, 2019 - Noblesville, IN-based, ARAC Roof It Forward, has been awarded the home service industry's coveted Angie's List Super Service Award for 2018. July 14, 2018 - ARAC Roof It Forward, headquartered in Woodstock, Georgia just announced its 2nd quarter donation of $14,100 to Camp Sunshine. April 6, 2018 - ARAC Roof It Forward just announced its first quarter 2018 donation to Camp Sunshine. The Q1 donation amount totaled $14,437.50! January 19, 2018 - ARAC Roof It Forward, headquartered in Kennesaw, Georgia, announced today its 2017 Q4 donation of $15,875 to Camp Sunshine. August 22, 2017 - ARAC Roof It Forward was honored to receive the Beacon Lighthouse award for meeting and exceeding industry standards. July 19, 2017 - ARAC Roof It Forward, headquartered in Kennesaw, Georgia, is proud to announce its second quarter 2017 donation to Camp Sunshine. A portion of every roof we build goes toward this amazing charity. May 1, 2017 - ARAC Roof It Forward, headquartered in Kennesaw, Georgia, just announced its first quarter 2017 donation to Camp Sunshine. The Q1 donation amount totaled $10,650.00. May 1, 2017 - Roof It Forward was proud to once again sponsor the 5 K Family Fun Run on April 22nd to benefit the Peyton Manning Children's Hospital. February 10, 2017 - ARAC Roof It Forward recently held their 2017 kick off meeting at the Camp Sunshine House in Decatur, Georgia. The highlight of the event included the major announcement that the company's 2016 donation total exceeded $43,000! December 16, 2016 - We heard of an elderly couple that was taken advantage of by another roofer. With some hard work, and Christmas Spirit, the Roof It Forward team stepped in to make things right. August 12, 2016 - Roof it Forward Indiana had the honor of sponsoring Touchdown for Kids (TDK) annual golf tournament on July 13th. 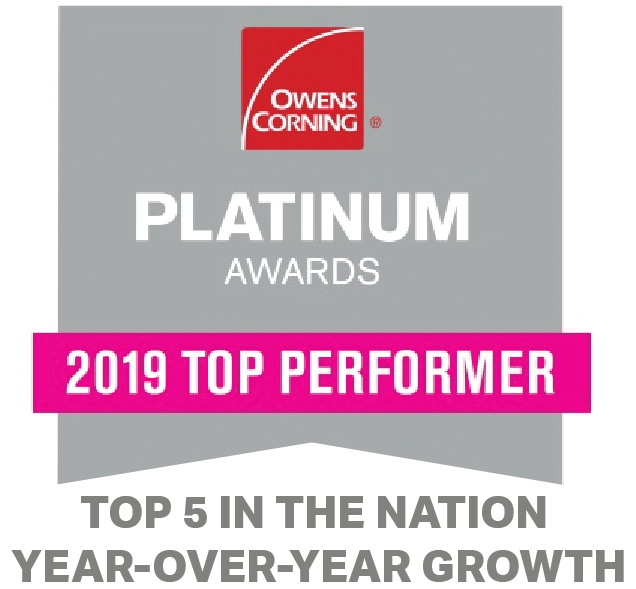 June 27, 2016 - Owens Corning Platinum Awards are given out yearly to deserving companies. The Spirit Award is given to one company nationally and this year that honor was given to ARAC Roof It Forward..
May 17, 2016 - ARAC Roof It Forward is excited to announce the winner of its Referral Rewards Program. We have been blessed as a company and are committed to honor that by giving back to the communities we serve. May 6, 2016 - Roof it Forward is proud to announce it's quarterly charitable donation in the amount of $7,600 to Camp Sunshine. Camp Sunshine gives children with cancer the opportunity to just be kids again and to enjoy normal activities like swimming, horseback riding, arts and crafts, and making friends. March 15, 2016 - ARAC Roof It Forward announced they will be a participating sponsor in this year's 5K Family Fun Run. Proceeds will benefit the Peyton Manning Children's Hospital in Indianapolis. Saturday, April 23, 2016 will mark the 5 year anniversary of this event being held at the Butler University Health & Recreation Complex in Indianapolis.